Broken Arrow Donates $24,000 through T-shirt Fundraiser! 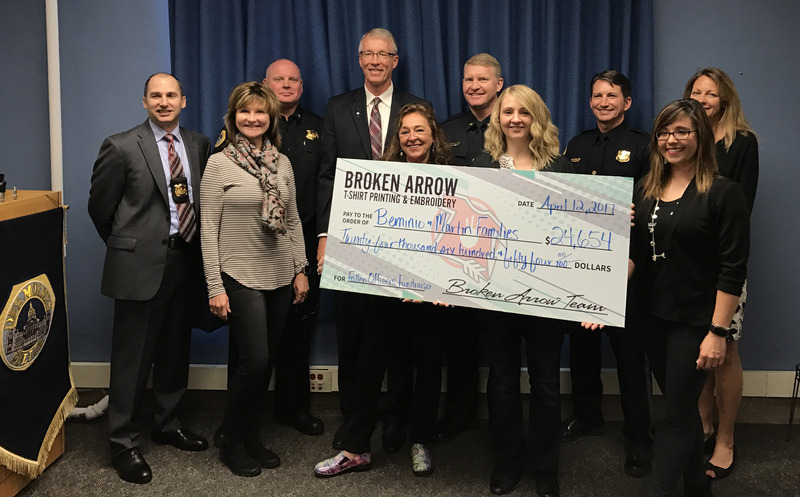 Broken Arrow T-Shirt Printing and Embroidery is honored to donate $24,654 to the families of two police officers killed in the line of duty. Fundraising organizer Kortni Remer says anyone can easily raise that kind of money for a good cause. Broken Arrow offers free group buying website pages for fundraisers, which makes fundraising easier than ever before. YOU sell custom decorated items printed by Broken Arrow. YOU set the price. YOU keep the profits. It’s as easy as 1, 2, 3! Customers pay directly on the personalized web page and items are shipped to each individual customer, so you won’t have to collect money or delivery anything.